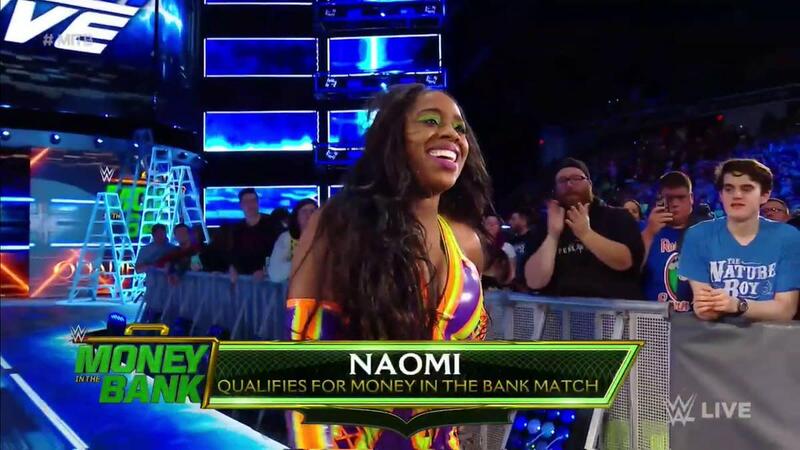 Two more women have qualified for the upcoming women’s Money in the Bank ladder match. Lana was the first to qualify tonight on SmackDown. She beat Billie Kaye in a pretty short match to qualify. There were some shenanigans as Peyton Royce got involved on the outside. Kaye jumped her from behind and threw her in the ring, but Lana cut her off with a kick then planted her with a facebuster for the win. Naomi followed suit later on the evening. She defeated Sonya Deville in a relatively short match with a roll-up. She joins Lana, Ember Moon, Charlotte Flair, Alexa Bliss, Becky Lynch and Natalya. Raw on Monday will determine the final entrant in the ladder match, which will take place at the Allstate Arena in Illinois on June 17. Bayley, Dana Brooke, Liv Morgan, Mickie James, Ruby Riott, Sarah Logan and Sasha Banks will compete in a battle royal to determine the last participant.